allowing to expand the PIP-Family with different size PCI-Express cards. 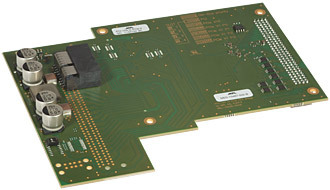 The PCI-104 to PCIe x1 Bridge extends the industrial PCI-104 Bus with a PCI Express x1 Card. 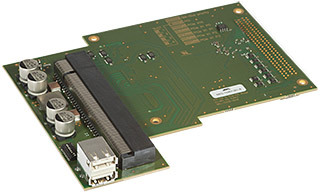 The PCIe/104 to PCIe x1/x16 Adapter extends the industrial PCIe/104 Type 1 Bus with a PCI Express x1 or a x16 add-in card and offers two USB2.0 connectors. PCIe add-on PCIe cards with a length up to 140mm will fit into the standard 83 and 120mm housings. Longer cards will fit too, but require an overhang in the housing as shown in the picture below. We can also provide passive cooling methods in case a graphic card or GPU needs to be installed. The adapter are designed in line with the specification for rugged embedded computers, hence can be used in environments of up to -40°C to 85°C. Stack: All PCI 104 to PCIe Expansions are stackable, but need to be on the top (highest stack position). with at minimum housing height of 82.5mm. Maximum length: 140mm for standard housing or up to 312mm for housing with overhang extension. Please note: The PIP housing depends on inserted PCIe add-in card. Please contact MPL for special solutions.